Homeschool students get to set their own paths for learning which allows them to explore their passions and interests a step further than from those who are traditionally schooled. Because of their educational experiences and backgrounds, more and more homeschoolers are admitted to hundreds of colleges and universities around the world. Colleges and universities have noticed that homeschoolers are dedicated to their education and there is no doubt that these characteristics take light during the application process. Majority of homeschoolers are involved in the community, participate in extracurricular activities, and take rigorous coursework such as AP classes or get ahead by dual enrolling at a local college. 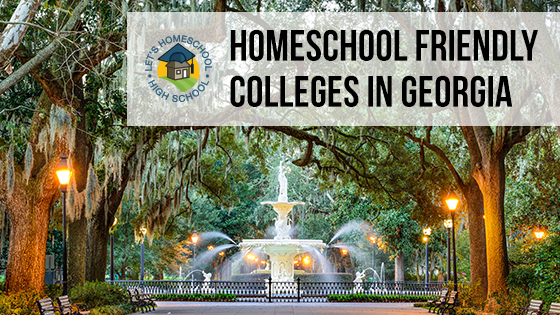 If you’re looking for Georgia colleges and universities that accept homeschoolers, this is a good place to start. We’ve listed the top college requirements for homeschoolers so you can get an idea of what you’ll need to do if you’re interested in that particular school. The University of Georgia (UGA) is a public institution that was found in 1785. The most popular majors at UGA are Finance, Psychology, Biology, Marketing, and International Relations and Affairs. 46% of the school’s classes have less than 20 students. The University of Georgia reviews all students alike and choose from the pool of academically qualified students that are most competitive. There are no set standards for scores or grade point averages, admission standards depend on the number and quality of students who apply each year. “Demonstrated academic achievement” is the primary factor for first-year admission decisions at the University of Georgia. Requirement 2: Coursework for credit that appears on an official college or an accredited high school transcript; and/or, An SAT or ACT score in the top five percent of college-bound seniors nationally in order to satisfy the English and mathematics portions of the CPC. Georgia Tech has a strong tradition of recruiting, enrolling and graduating highly competitive home school students from throughout the United States and worldwide. Georgia Tech is a leading research university committed to improving the human condition through science and technology. In their review of homeschool students, their committee utilizes the same factors as students attending a traditional high school. First-year applicants to Georgia Tech will be reviewed in a selective, holistic admission process. Requirement 1: If your home school program is approved by SACS or another regional accrediting agency, you do not need to provide additional documentation. Savannah Tech offers more than 150 different programs for their students to excel in. Some of those programs include Aviation Technology, Business and Technology, and Public Service. All applicants must first meet that state standard minimum requirements for admission and then be referred to the individual programs that they are interested in. Savannah Tech is committed to meeting the dynamic education, academic, and workforce development needs of individuals, employers, and communities throughout the Coastal Empire with market-driven, environmentally-conscious education offered in the classroom, laboratory, community, and online. Submit a Certificate of Attendance form from the local superintendent’s office if graduated before 2012 or Georgia Department of Education verifying that (1) the parent or legal guardian notified the superintendent of intent to homeschool and (2) that the parent or legal guardian submitted the required attendance reports as required by O.C.G.A. § 20-2-690. With an average undergraduate enrollment of 18,000 and more than 50 academic majors, The University of North Georgia provides a culture of academic excellence in a student-focused environment that includes quality education, service, inquiry, and creativity. This is accomplished through broad access to comprehensive academic and co-curricular programs that develop students into leaders for a diverse and global society. They pride themselves in high quality and affordable education. The University wants to also see their students succeed and develop as leaders throughout their time at UNG. Requirement 3: Students whose secondary education was completed outside the United States system of education must also meet English Proficiency Requirements. At Georgia State University in downtown Atlanta, students have more than 200 majors and minors to choose from. The university is known for its committed research at its institute, so students can get involved and present their findings at the annual Undergraduate Research Conference. All first-year students have the option of opting into the Freshman Learning Communities program. This program allows students to become accumulated with their new lifestyles and allows them to meet other students who share the same interests. If your student is looking for a smaller college to attend, Berry College might be an option to consider. Berry has an average enrollment of 2,000 undergraduates and 99% of their professors hold a Ph.D. or equivalent degree. Berry College has a wide range of educational backgrounds in there student community. Their students come from public schools, private schools, international schools, and other colleges or universities. Abraham Baldwin Agricultural College (ABAC) provides their students with a quality education and new experiences. ABAC provides more than 3,300 students with a unique opportunity to learn and grow. Students at ABAC not only engage in the classroom, but also outside with more than 50 student organizations. Homeschool students are welcomed and assessed in the application process like traditional students. ABAC looks for students willing to be challenged and that display excellence. Requirement 1: Submit a certificate of attendance form from the local superintendent’s office or a Declaration of Intent form from the Georgia Department of Education. Requirement 2: Submit annual progress reports or a final transcript for the equivalent of the student’s junior and senior years. The report should include the graduation date. Requirement 3: Take the ACCUPLACER placement test. Requirement 1: Submit annual progress reports or a final transcript for the equivalent of the student’s junior and senior years. The report should include the graduation date. Requirement 2: Submit ACT/SAT scores that are less than 5 years old and meet the college’s minimum requirements for program readiness OR achieve placement test scores that meet the college’s minimum requirements for program readiness. The University of West Georgia is a comprehensive doctoral-granting university located in Carrollton, Georgia. A record 13,520 students were enrolled as of Fall 2017, ranking 7th among Georgia’s public colleges and universities. Some of the more popular majors at the University of West Georgia include Business, Management, Marketing, Social Sciences, Health Professions, and Education. Homeschooled students are more than welcomed and encouraged to apply, the university assesses applicants all the same. Requirement 2: Official transcripts, showing completion of College Preparatory Curriculum, from an accredited public/private high school. Official transcripts from colleges you may have attended also must be submitted. West Georgia Technical College supports their student’s success, economic development, and community by providing a skilled workforce through the delivery of relevant education and training opportunities. Applicants who have graduated from a non-regionally accredited homeschool program in the state of Georgia should complete these steps for admission into West Georgia Tech. They are assessed for admission the same as traditional students. Georgia Highlands College gives students both value and quality education. It is one of only two colleges in Georgia listed in a 2015 national database as the “best value” and “best return on investment” in the state. Students at GHC can complete an associate degree for less than $8,000. Even at half the cost of most colleges and universities nationwide, GHC offers several areas of study, including associate, bachelor’s, and online degree options. Covenant College has a large number of homeschooled students in their student body, almost 23%. Covenant’s mission as an educational institute is to educate Christians to engage culture and values, examine creation and to pursue biblical justice in the community. If your student is interested in exploring Christ’s preeminence in all things then they may want to consider attending Covenant College. Covenant College offers students an academically rigorous liberal arts education. It is important for applicants to understand they are looked at individually. At Valdosta State, offers the best of both worlds. The rigorous academic, culture, and social opportunities of a major university while taking advantage of small classes to help you get the best out of learning. Their class sizes give you the flexibility to tailor learning to your interests and needs. You’ll find an education shaped to fit your goals, not a cookie cutter degree for the masses, and a personal journey to your graduation day. The mission at East Georgia State College is for the faculty and staff to provide their students with a rewarding college experience. There are many student organizations such as intramurals, athletics, and on-campus events there are many ways for the student’s to get involved with the community. Whether your student is pursuing an associate or a bachelor’s degree, EGSC offers many programs that students might be interested in pursuing a career in. Toccoa Falls College accepts all types of students. Fun fact, each fall about 10% of the Toccoa Falls incoming class consists of students that have been homeschooled. Their mission is to help students adjust to college life and ensure that Toccoa Falls is an excellent choice for homeschoolers because of their small classes and low faculty to student ratio. TFC is committed to helping each student transition smoothly into their college career. Many home-educated students have made Clayton State University their choice for post-secondary education. The reason being Clayton State offers personalized attention, smaller class sizes, affordable tuition, outstanding faculty, and amazing campus life. With over 34 majors to choose from, the faculty thrives on making sure your student will be successful in his or her endeavors.